Six years ago today, on October 5, 2007 at 2:54 am, 18 year old Taylor Cothran fell from his fifth floor window in the Capstone Residence Hall at the University of South Carolina, Columbia. He died a few days later from his injuries. Nobody could have imagined that the personable, handsome six foot tall freshman would meet his demise that night. Witnesses reported they heard the sound of a glass bottle breaking on the 2nd floor roof below Taylor’s window. A few minutes later they heard a loud thud when Taylor’s blanket-wrapped body hit the roof. The facts surrounding Taylor’s fall are mysterious, even bizarre. The sill of the single hung window was about 3 feet above the floor. The blinds were down and the window was closed. A couple of tray tables stood before the window with objects still standing on them. The headboard of a bunk bed blocked access to the window from one side and a box was on the floor blocking the left side. Above the window was the upper bunk pressed tight against the window. There is no visually plausible way for him to have experienced a window fall from this college dormitory, especially wrapped in a blanket. 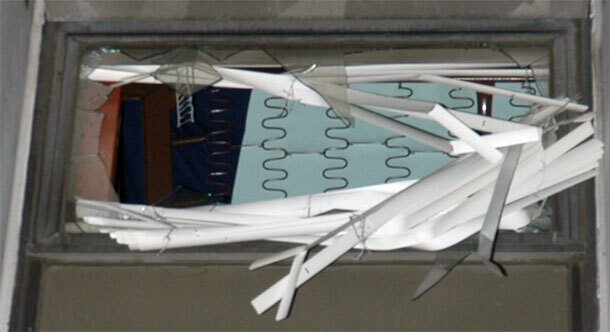 The glass in the single-gazed aluminum window was .075″ thick, barely over 1/16 of an inch. Reconstructing the point of impact from the glass remaining in the opening, it appears that there were two impacts, the first toward the left side of the window where the blinds are destroyed followed by one farther to the right. As is common in window falls, the glass at the bottom of the window was crunched down close to the sill while sizeable shards remained in the sides and top of the frame. Taylor fell about 30 feet. He would have impacted the roof surface at about 22 miles per hour. The unyielding roof surface extracted maximum damage on Taylor. Although the head trauma eventually killed him, he also had three breaks in his pelvis, a broken left femur, a large laceration on his chin, lacerations on his chest, right elbow and both knees. His descent took almost exactly one second. Friends who were with him earlier that evening said he was anxious to get back to his dorm room because he had a morning class the next day. He had smoked pot that night and by some accounts and ingested at least one “shroom”. Friends who dropped him off at his dorm were concerned and called him in the minutes and hours prior to his fall. They say he picked up the phone but did not speak, only breathed into the phone. The last of those calls was less than 10 minutes before Taylor fell through the window. Exterior view looking up at the window immediately following Taylor Cothran's fall. The window and blinds were closed but broken through. The bunk bed was tight to the wall above the window. After his fall Taylor was rushed to the hospital and his parents were notified. Teresa and Tom endured the 90 mile trip to Columbia, then spent nearly six days at Taylor’s side, praying for his recovery. Their prayers were not answered. Taylor died on 10/11/2007. 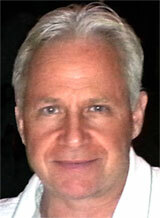 His organs were harvested and sent out to affirm the lives of others in dire need. 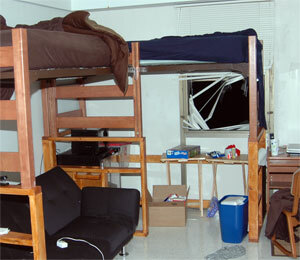 Taylor Cothran's dorm room soon after he fell from the window. There were obstructions all around the window opening. How did he, wrapped in a blanket, get through the window? I know from the experience of having lost two cousins in their teens, there may be no greater pain that that experienced by a parent who loses a child. It is a permanently life-changing event for parents and siblings. This was true in the case of Teresa, Tom and sister Tara. To bring some kind of meaning to their son’s devastating death, they started a foundation, Taylor’s Helping Hands, that brings support to families similarly traumatized by catastrophic accidents and losses. They have now helped hundreds. One simple but profoundly needful service they provide is to give a bag of essentials to people who suddenly find themselves caught in the timeless, disorienting world of hospital vigils, waiting for the next test, the next diagnosis, the next eyeblink of their critically injured loved one. One of the simple items in the bag: kleenex. Teresa wanted to know if her family had any recourse against the university. For any number of reasons her attorneys said no, she had no case. The police had long before deemed the event an accident and after taking statements from friends and writing reports, closed the case. There was simply nothing else to do but mourn and question. Why? How? Teresa reached out to me a while ago and told me her story. I was saddened and horrified, even though these matters do tend to come my way. I spent some time and studied a pile of reports she sent me. I knew I could never answer the question “why” for her, but at least maybe I could answer the question “how”. It was not to be. I can’t understand how Taylor went out the window that night. 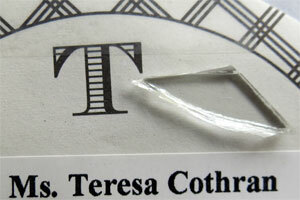 But Teresa was overflowing with gratitude that I gave her precious son’s memory a few moments of importance. All I did was try to understand and that was enough for her. It was more than she had. When writing this article I struggled with, “Where do I want to take this? What is my goal? What is the message I am trying to convey? For what it’s worth, This is what I’ve got. College is a time when adolescents follow a zigzag path toward adulthood. They try new things and don’t always make good choices. They feel immortal. To them I say, read Taylor and the Cochrans’ story. Be grateful it did not happen to you, then make sure it never does. You are not as immortal as you think. Really bad things can happen in an eyeblink. And take care of your friends. To parents I say, you have a tough job and there is no cookbook answer. If your household rules are quite restrictive, ask yourself if this much control will prepare your child for a time when there are few rules. If your child is a bit wild, you will need to work on reasonable controls and increasing structure. With all kids, try hard to keep lines of communication open. To universities and their architects I say, it’s time to focus on window safety. Articles about window falls from college dormitories abound on the internet. It’s time to review the building codes we have in place alongside the sad list of accidents that seem to happen every year in our colleges and universities, and add safety measures that better protect our children as they work their way toward adulthood. Are college dorm windows safe? Outside the test chamber, the blank wall with the chamber door is seen. The lab has painted it to protect it from the punishing test sequence to come.